Top-seeded Louisville beat Michigan without a whole lot of stress, winning 71-50 in their second-round matchup with the Wolverines to go to their third Sweet 16 in a row. 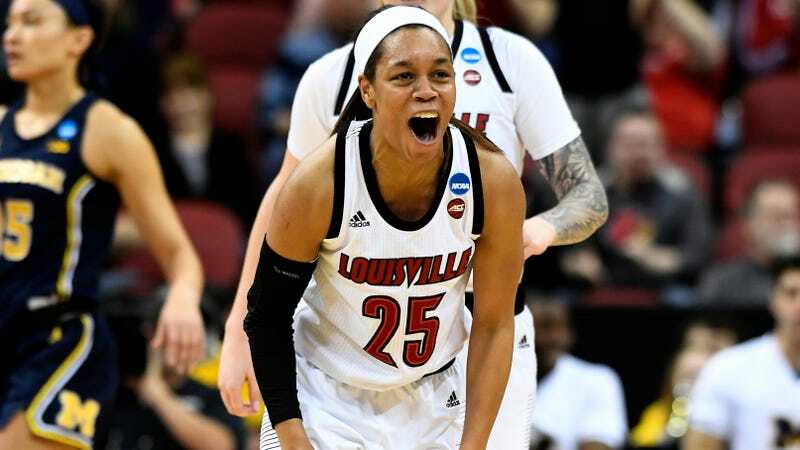 The Cardinals got to relax in large part thanks to the stellar play of high-scoring senior guard Asia Durr, who as usual had an all-around brilliant performance. Durr, the two-time ACC Player of the Year who’s a threat to explode in every game, unsurprisingly carried the offensive load for the Cards. Durr went off for a game-high 24 points, including five threes, but her most impressive plays weren’t her own buckets. On defense, she was just as much of a headache for her opponents, nabbing three steals and blocking two shots, including this suffocation on a Michigan fast break. Durr also led her team with five assists, one of which was her most gorgeous play of the game. Durr essentially took out three maize-and-blue defenders with one no-look dish, and Jazmine Jones put the icing on top with an easy lay-in. Louisville will next play either Oregon State or Gonzaga in the Sweet 16, but Durr and the Cardinals surely have eyes on the much bigger match-up that would follow. Win one more game, and they’ll likely have a date with UConn with a Final Four trip on the line.